Jesus in Prayer. 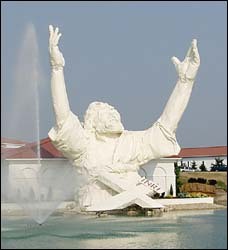 "King of Kings," Solid Rock Church, Monroe, Ohio. Designer: Brad Coriel, Artist/sculptor: James Lynch. What is it like to have a High Priest? We don't have any real experience here, either as Gentiles or even contemporary Judaism for nearly two thousand years. In this passage our author spells out some the great blessings of Jesus, our great High Priest. I'll trace the logic of our writer's argument for you, but not linger. We'll spend most of our time probing and luxuriating in the passages that describe how Christ serves as High Priest on our behalf. "13When God made his promise to Abraham, since there was no one greater for him to swear by, he swore by himself, 14saying, 'I will surely bless you and give you many descendants.' 15And so after waiting patiently, Abraham received what was promised. The writer is making the point here: We can surely trust God who has promised us eternal life with Christ. Abraham is the example. God's oath, in which he swears by himself, since there is no one greater (quoting Genesis 22:16). We who are exhorted to keep on trusting God have sufficient reason for our confidence. From faith, hope is but a small step away, Greek elpis, which is "the looking forward to something with some reason for confidence respecting fulfillment, hope, expectation. "2 Bultmann comments, "When fixed on God, hope embraces expectation, trust, and patient waiting. It is linked to faith, as in Hebrews 11:1, which stresses the certainty of what is divinely given. "3 Our Christian hope is not a hope-so kind of longing, but a firm expectation in the fulfillment of all God's promises. Our writer now uses an interesting word, katapheugō, "flee, to gain shelter from danger, take refuge. "4 Vincent says, "It expresses flight to a definite place or person for safety, hence often used in connection with an altar or a sanctuary. "5 Our writer describes us Christians as those who have fled for refuge in Jesus, who alone can bring us hope. Fleeing danger is not a sign of cowardice but wisdom. Jesus is our sanctuary for refuge. Symbol of an anchor found alongside two fish in the Christian catacombs, Rome. More anchor symbols. Our author now compares our hope in Christ to an anchor for the soul, "firm and secure." Ancient anchors were shaped much like our own, heavy and designed to bite into the bottom in order to hold a ship fast from being blown out to sea in a gale. The anchor was an early symbol of our Christian hope, often found carved into marble tombstones in the Roman catacombs -- no doubt based on the analogy suggested by this verse. The form of the cross at the top of the anchor also reminded early Christians of their hope in the cross, and Jesus' death for all their sins. Notice that we must not be passive about hope, but "take hold of" it. The word is krateō, "seize, hold fast," from kratos, "power, strength. "8 This theme of grasping hold of the promises of God is found throughout Hebrews (3:6, 14; 6:15; 10:36; 12:1). The result of our hope and expectation in Christ is strong encouragement, expressed by two words. Ischuros means "strong, firm, sure. "9 Paraklēsis, translated "encouragement" (NIV, NRSV) or "consolation" (KJV), is related to the word for Paraclete or Comforter, the One-Who-Comes-Alongside-to-Help. Here it means, "act of emboldening another in belief or course of action, encouragement, exhortation. "10 It can also carry ideas of "comfort, consolation, solace." Q1. (Hebrews 6:18b-20) In what sense have we "fled to a place of refuge"? Why are we to "take hold of" this hope actively? How does Christian hope differ from hoping that something is true? In what ways does an anchor illustrate the idea of hope? Diagram of the Tabernacle in the Wilderness. Not to scale. The tabernacle and later the temple building was divided into two rooms: (1) the Holy Place, where the priests ministered daily, and (2) the Holy of Holies, where the high priest entered once a year on the Day of Atonement, to make atonement for Israel's sins that year. A veil of heavy cloth separated the "inner sanctuary" (sometimes referred to as the "Holy of Holies") from the "outer sanctuary" (sometimes called "the Holy Place"). The writer is ready to develop the role of Jesus as our High Priest who entered the heavenly "Holy of Holies" and presented before God his own blood for our sins. We, too, will stand before God, but he is referred to in verse 20 as a "forerunner" (prodromos). This word was used in Classical Greek to refer to "one who is sent before to take observations or act as spy, a scout, a light-armed soldier. "11 Here it refers to Jesus who gets to heaven before we do, presenting his own blood as a sin offering, so to "prepare a place for us" (John 14:2). When we get there, he will have paved the way and will be waiting for us, seated at the right hand of the Father to speak on our behalf as our Advocate (1 John 2:1). Now, having reintroduced the idea of Jesus' high priestly ministry before God, he begins an argument that Jesus is qualified to serve as our priest. The writer recounts the story of Abraham defeating the Mesopotamian kings that had attacked Sodom and carried away its residents as slaves -- including his nephew Lot (Genesis 14). Abraham takes his own private army, disperses the enemy army by a surprise night attack, and rescues the prisoners as well as all the plunder of war that had been seized. On Abraham's way back from the battle, Melchizedek, "king of Salem and priest of God Most High" comes out to meet him. Salem (which means "peace," Hebrew shalom) is another name for Jerusalem. Receives as a tithe, 10% of the plunder recovered from the Macedonian kings. These facts and the mention of Melchizedek in a Messianic prophecy (Psalm 110:4) are the raw material that the writer of Hebrews works with to fashion his argument that Jesus' priesthood has a greater validity and longevity than the Levitical or Aaronic priesthood of Judaism. What does the writer of Hebrews mean? He is using a rabbinical approach to interpretation common in first century based on an argument from silence. For the sake of argument, according to this reasoning, if it isn't mentioned in the scriptural text, it cannot be assumed. Thus, since Melchizedek's parents, lineage, birth, and death aren't mentioned in Genesis 14, he is "without beginning of days or end of life, like the Son of God he remains a priest forever" (7:3). Does this mean that Melchizedek actually had no parents, no birth, and no death? No. I don't think so. This is rather "an outstanding example of the argument from silence in a typological setting." Bruce mentions a number of examples of this kind of argument from silence which the Jewish theologian Philo uses for allegorical purposes.12 It isn't the way we would argue today, but it had weight to the people our writer was trying to convince, so he argues in this fashion. Therefore, Melichizedek's priesthood is superior to Aaron's Levitical priesthood. Perhaps we wouldn't use the same argument, but then, we're not in a very good position to know what argument will most effectively convince the Jewish Christians our writer is addressing. Think of it as a sermon in context with a particular congregation at a particular point in history, and you'll get the idea. Then God wouldn't have spoken through the Psalmist about an eternal priest in an entirely different order. Therefore, Jesus qualifies as a priest in Melchizedek's order. It's a fairly involved argument that had impact for the initial readers of this letter. "18The former regulation is set aside because it was weak and useless 19(for the law made nothing perfect), and a better hope is introduced, by which we draw near to God. Our writer makes a point about the oath ("the Lord has sworn") mentioned in Psalm 110:4. Priests are ordained without an oath, he says, so that being declared a priest by means of an oath is superior. Far more than a human high priest, Jesus himself is responsible to bring about the New Covenant -- and did on the cross. At his return he will usher in the Kingdom in all its glory and the New Heaven and New Earth (Isaiah 65:11; 66:22; 2 Peter 3:13; Revelation 21:1). Q2. (Hebrews 7:22) What is a guarantee or surety? In what sense is Jesus the guarantor of the New Covenant? Jesus lives or continues15 forever -- literally, "unto the ages." Jesus has a permanent or unchanageable16 priesthood. Jesus' intercession for us is mentioned elsewhere in the New Testament (Romans 8:21, 34; 1 John 2:1), but here the writer ties this priestly act to Jesus' continual and permanent High Priestly ministry. If you're in trouble, Jesus is interceding for you before the throne of God. Not as a supplicant, but as enthroned Priest-King at the right hand of the Father! Q3. (Hebrews 7:24-25) Why is Jesus able to save people "completely" -- "to the uttermost" according to verse 25? What is the essential function of a priest? Why is intercession the essence of being a priest? The phrase "once for all" (7:26b) translates the word ephapax, "taking place once and to the exclusion of any further occurrence, once for all, once and never again. "25 Of the five times it occurs in the New Testament, it is found in this sense twice more in Hebrews (9:12; 10:10; also Romans 6:10). Its repetition in Hebrews underscores the absolute uniqueness and finality of Christ's death for sins. The readers of Hebrews cannot go backwards from Christ's unique, final atonement. Next, our author says, "He offered himself" (7:27b) for our sins. Think about that for a moment. He offered himself as the way to solve our sin problem. We fell short, he stepped in at the greatest cost imaginable -- that is, of the holy, divine, pure Son of God bearing the filth and degradation of our sin on himself. It boggles the mind to think what that would have meant. Gethsemane is not about dying. Many men have died bravely for a cause. But the agony of Gethsemane is about the Holy One bearing sin. "He offered himself." Lessons are also available in e-book and paperback formats. "Once made perfect, he became the source of eternal salvation for all who obey him and was designated by God to be high priest in the order of Melchizedek." (5:9-10). Our salvation was costly, but now it is eternal salvation, it is "once for all," and we are the ever-grateful recipients of God's largess in Christ Jesus. This is the very good news of the gospel! Q4. (Hebrews 7:26-28) How is Jesus described in verse 26? How does Jesus differ from human high priests? What about Jesus' role as High Priest gives you special confidence? Thank you, Father, for your immense love in sending your Son to us. While we were yet rebellious sinners, Christ died for us. Thank you for loving us that much and believing that we are worth saving. In Jesus' name, we pray. Amen. Bebaiōsis, "confirmation, validation." The word is "a legal technical term for guaranteeing, furnishing security" (BDAG 173). Rudolf Bultmann, elpis, ktl., TDNT 2:529-535. Asphalēs, BDAG 147; Thayer 82, a.
Wilhelm Michaelis, kratos, ktl., TDNT 3:905-915. Paraklēsis, BDAG 766. O. Schmitz, parakaleō, TDNT 5:793-799. Prodromos, Thayer 538. The word means literally "running before," "going ahead" (BDAG 8867). Bruce, Hebrews, p. 159, fn. 18. He cites Gottfried Quell, apatōr, TDNT 5:1019-1021. Bruce, Hebrews, p. 171, fn. 70. Meno, "remain, continue," BDAG 630-632. Aparabatos, "permanent, unchangeable" (BDAG 97). Pantelēs in Classical Greek means, "all-complete, perfect." With the preposition eis, "unto completeness, completely, perfectly, utterly" (Thayer 476). "Pertaining to meeting a very high standard of quality or completeness, completely." However it could also mean, "pertaining to unlimited duration of time, forever, for all time" (BDAG 754-755, 1.a. and 2.). Entugchanō, Thayer 219, 2. "To make an earnest request through contact with the person approached, approach or appeal to someone" (BDAG 341). Hosios, BDAG 728, 1.b. Vincent (Word Studies, in loc.) comments: "Throughout the New Testament its look is godward. In no case is it used of moral excellence as related to men...."
Amiantos, BDAG 54, b. It is derived "from a, "not" + miainō, "to defile," especially to defile by staining, as with color (Vincent, in loc.). Ephapax, BDAG 417, 2. Gustav Stählin, hapax, ephapax, TDNT 1:381-384.